Easy baked chicken wings have a spicy herb coating and a sweet and a tongue tingling honey bourbon glaze. So totally addictive that you just can’t stop at one! 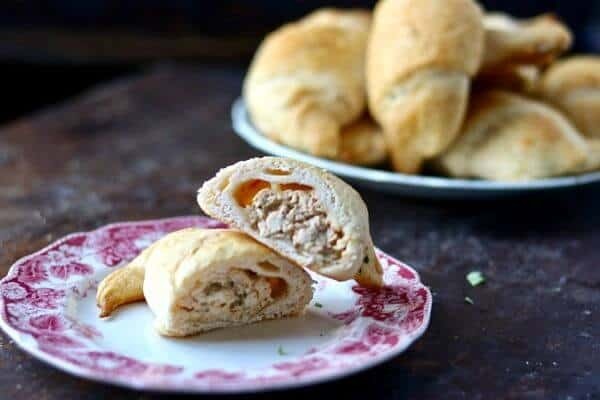 Make them for football season and tailgating, summer parties, or movie night with the family – they are basically shake and bake! You can substitute boneless chicken breast or thighs for the wings if you like them better. 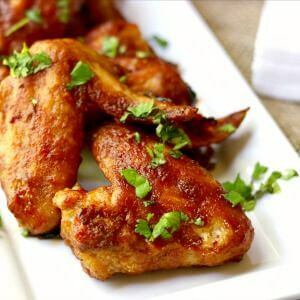 For this recipe you’ll need: chicken wings, flour, Tony Chachere’s seasoning, smoked paprika, cooking spray, barbecue sauce – your favorite, honey, bourbon, chipotle in adobo, butter, garlic powder. I don’t know about you but I like food that makes my taste buds stand up and take notice. I love that little tingle that lingers after the bite is swallowed. AND I like chicken wings when they’re done right. Believe me, y’all, these are done right. The one thing I’ve always disliked about wings, though, is the frying. Let’s be real for a minute — frying is messy. Like pools of oil, wadded up paper towels and dear-God-someone-call-a-cleaning-crew kind of messy. These are not off — in fact they are very much ON. Spicy cajun seasoning gives them both heat and crunch while the sticky honey bourbon sauce makes them sweet and even spicier. Grab one up, take a bite, enjoy that tingle, then lick your fingers…Repeat. That’s the way wings were meant to be eaten. You have questions? I have answers! Here are the most common questions about baking chicken wings. How long do you bake chicken wings at 350? 375? 400? 425? What temperature should chicken wings be cooked to? Just like any other chicken, wings should be cooked to about 165F. It’s usually good to take them out of the oven at 160F and let them sit for 5 minutes or so. They’ll continue to cook as they sit. That way they won’t overcook and get dry. How to Cook Chicken Wings in a Convection Oven? Wings will cook at a slightly lower temperature and for slightly less time in a convection oven compared to a regular oven. How do you prepare wings for baking? Normally you’ll disjoint them and separate the wingette and drumette, or you can buy they already done. Sometimes I get lazy and just leave the whole thing together – no one has ever complained. In fact, that’s how I did these. After they are disjointed pat them dry with paper towel. This ensures that the spice mixture sticks! That’s really about it – wings are super easy. If you’ve every had “boneless chicken wings” you probably know that the chicken used is skinless, boneless breast or thigh meat. It’s an easy exchange. You’ll want to slice the chicken in strips a little wider, and about as long as, your finger. Pat it dry and roll it in the spice mixture. Let it sit for several minutes and then roll in the spice mixture again. Bake, checking the internal temperature after 15 minutes and then keeping an eye on it. Continue with the instructions as written. Tony Chachere’s is the seasoning that I use with these wings. It’s not super spicy but it does have a lot of flavor. If you like things really spicy add a pinch of cayenne, or to your taste. 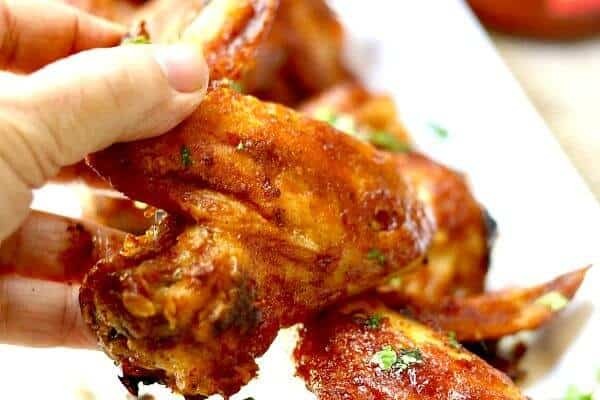 Whether you’re making these for game day or game night you’re going to love how quick and easy these oven baked chicken wings are! The sauce is so good and works well for meatballs or barbecued chicken or pork. If you like this recipe please consider giving it 5 stars. If you are looking for more of a meal you might want to check out my yummy bourbon chicken recipe. OMG – so good. Who doesn't like wings? Spicy chicken wings are a must serve for game day but they’re just as good for snacking all year. 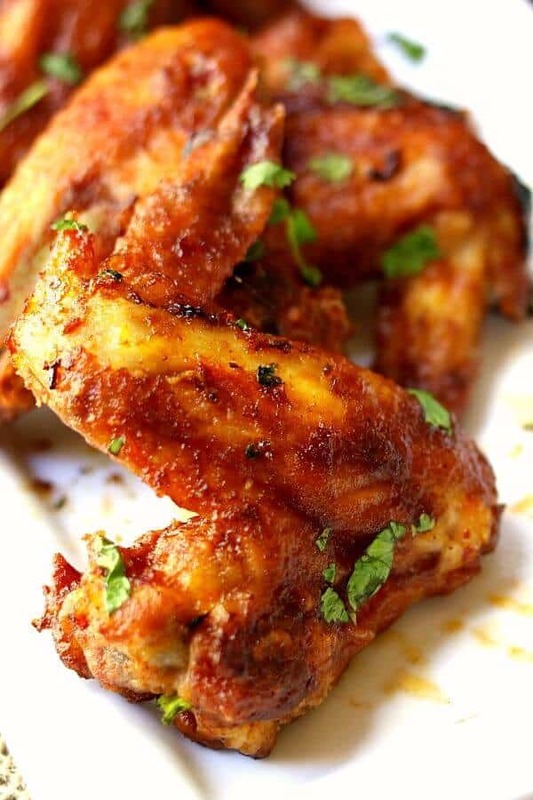 These tongue tingling wings are oven baked then sauced with a sticky honey-bourbon mixture that is addictively sweet and spicy. Simmer over low heat, stirring often, until thick – about 30 minutes. Turn the burner off and let the sauce stand while you’re making the wings. It will thicken. Disjoint the wings and separate the drumettes from the wingettes OR leave them whole as I have here. Blend the flour, Tony Chachere’s seasoning, and smoked paprika in a bowl. Blot the wings with paper towel to dry. Dip the wings into the flour mixture until thoroughly coated. Arrange them in a single layer on the baking sheet. 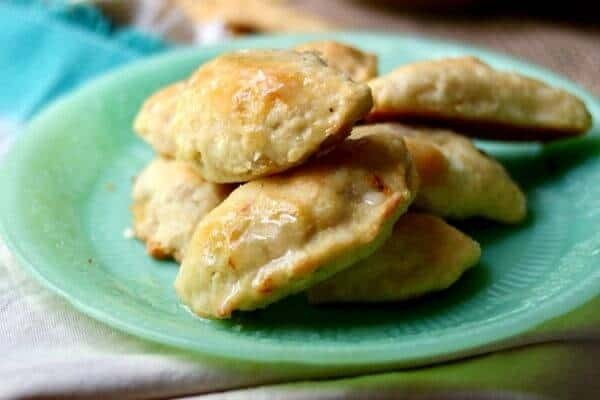 Place the baking sheet in the preheated oven. Cook for 15 minutes, watching carefully so they don’t burn. Turn the wings and cook 20 to 30 minutes more, watching carefully. Remove from the oven and dip the wings into the sauce. Be careful, they're hot! Place the sauce covered wings back on the baking sheet. Cook for 5 minutes more, or until an instant read thermometer registers 160F-165F. I did not disjoint the wings for this recipe. One serving =3 whole wings or 6 disjointed ones. 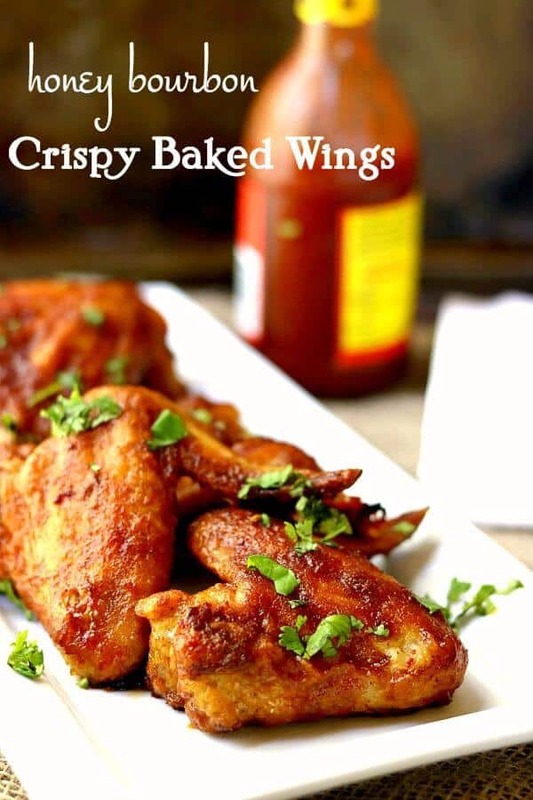 Crispy Oven Baked Wings – Recipe Tin Eats – Super crispy oven baked wings that really are SERIOUSLY crispy! Easy, too! Dry Rubbed Baked Wings – The Chunky Chef – Tender and juicy these baked chicken wings are coated in a mouthwatering homemade dry rub that will have your tastebuds singing!